From the Olympic Peninsula we drove north to Abbotsford, BC for the Snowbird RV Show. 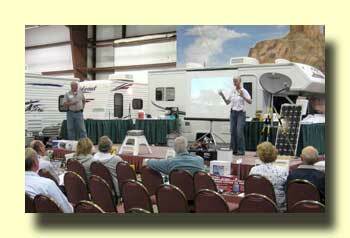 We've been presenting seminars about RV travel to Mexico at this show for over ten years now. Generally we do the presentations on a central stage and get to talk two or three times a day. The best part of the deal is that RVers from British Columbia are big Mexico fans. Each winter we see these same folks at RV parks throughout the country! 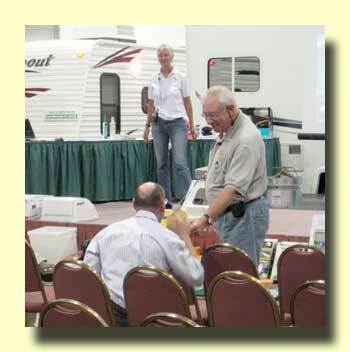 If you want to get excited about Mexico make sure to attend the Snowbird RV Show. This year has been unusual because there's been quite a bit of enthusiasm about travel on into Central America. The fourth edition of Traveler's Guide to Mexican Camping now includes campgrounds in Belize and Guatemala. For those wanting to go farther, Harriet and John Halkyard, authors of 99 Days To Panama, are also giving talks at the show. 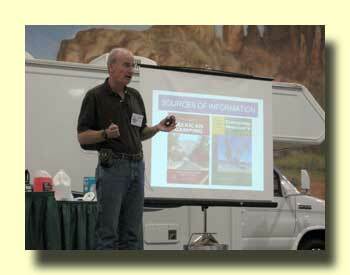 It's been a lot of fun having them here to help spread the word about RVing south of the border.